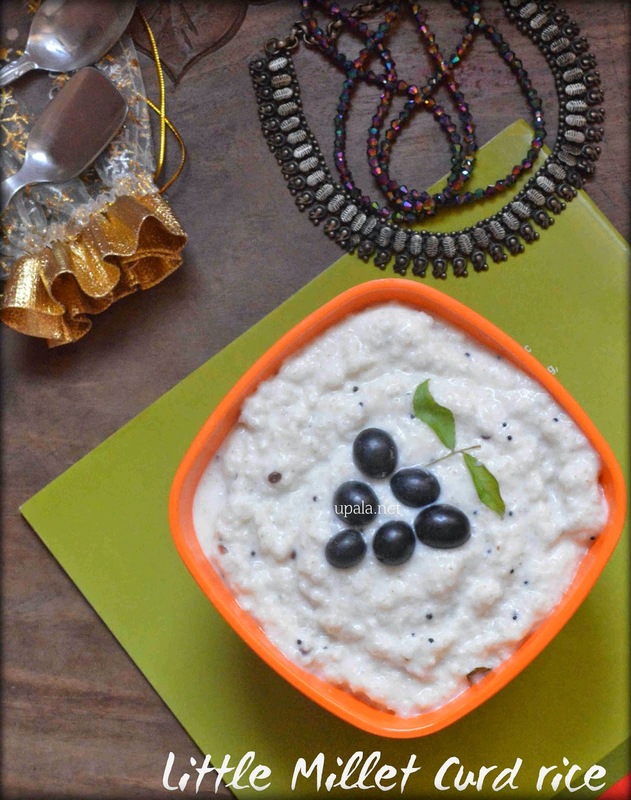 Samai bagalabath/Little millet curd rice is one of soothing food for this Summer. Generally Bagalabath is made with Raw rice but I have tried the same recipe with Gluten free fibre rich nutritious little millet. 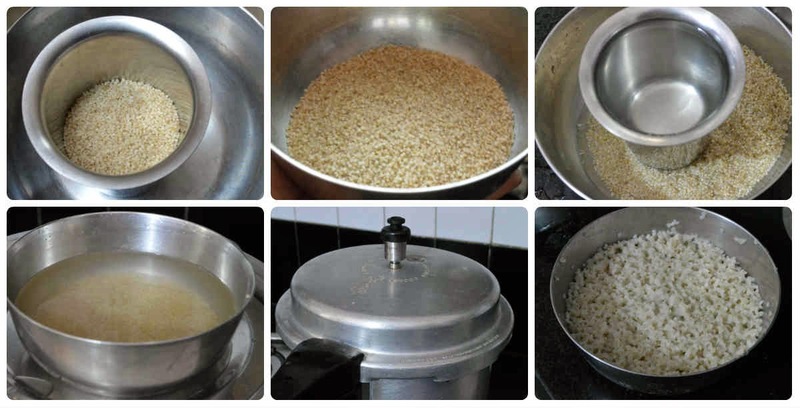 Nowadays Siruthaniyangal/Millets are most sought alternatives for Polished white rice. I am sure this Little millet Bagalabath is great recipe for Millet lovers. 1) Wash and clean Little millet/Samai and add water to it. 2) Pressure cook it for 3-4 whistles. I have kept in a separate bowl in same pressure cooker in which I cook rice to save time. 3) After pressure subsides, leave the little millet to cool down. 4) Mash the cooked little millet using a ladle. Add milk, salt and mix well. 5) Heat oil in a kadai and add Mustard seeds to crackle. Then add Hing, Urad dal and fry till light brown. Finally add Red chilli, Curry leaves and fry. Pour this seasoning mixture over Little millet and mix well. 6) Finally add Curd, Grapes and mix well. Tasty Little millet Curd rice/Samai thayir sadam/ is ready. 1) You can also add 1/2 finely chopped green chilli for extra spiciness. 2) Adding 1/4 tsp of Finely chopped ginger gives nice Ginger flavour. Same way you can also add 1 tsp of Finely chopped coriander laves. 3) You can also add green grapes or pomegranate seeds. 4) If you prefer to go with veggies instead of grapes, you can grate carrot, cucumber and Raw mango and add. 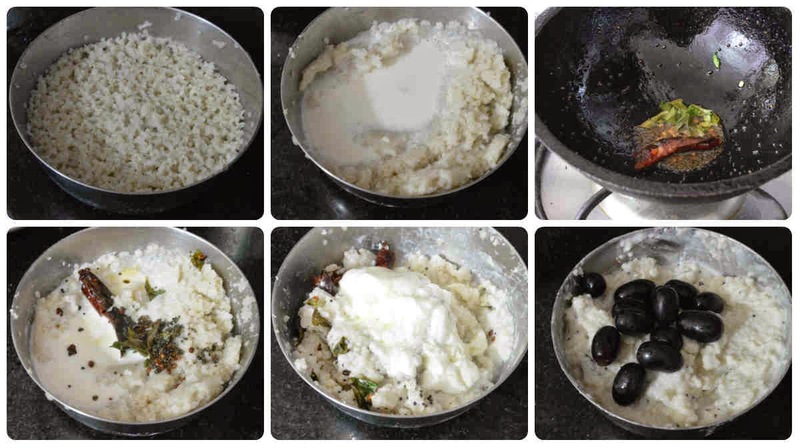 5) If Samai curd rice becomes thick after sometime, add more milk and adjust the consistency.